I’ve been so busy these last few days that I haven’t had a chance to do anything. I did, however, manage to pop into Superdrug in search of chocolate before the theatre last night and stumbled across an amazing offer from my favourite lash brand, Eylure. I’m a huge fan of their lashes because they’re easy to use, fit the width of my eye perfectly and can be used over and over again. The glue is also pretty ace and comes with me wherever I go – I’ve been known to throw away glues from other lashes and use the Eylure one instead! 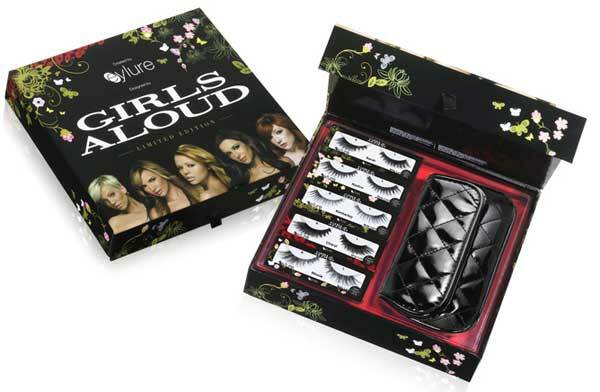 Eylure launched these Girls Aloud lashes last year and they seems to spread like some kind of Swine Flu outbreak across the country… literally everywhere I went they were there. They were launched as a gift set for £20 at Xmas, but now they’re only £9.99 for all five sets! Normally these retail at £6.08 each, so you basically buy one and a bit and get the rest free…. an absolute bargain. You even get a little pouch with it so you can carry them around with you so you don’t lose all the bits and bobs once you take the lashes off. 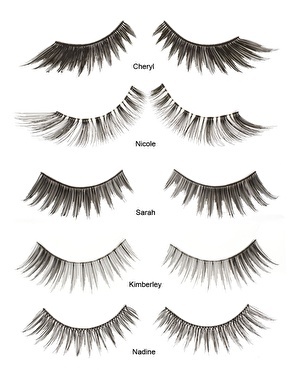 I've tried the Cheryl ones and they're really cool for a party – very dramatic! I've tried the other Eylure ones which are very similar to Nadine & Sarah's. Go get 'em!